Quesadillas, Flautitas, Nachos, Mini Chimichangas, guacamole and sour cream. Citrus marinated shrimp, mango, jicama, avocado and pico de gallo. Six mini shredded beef Chimichangas with queso. Chilli con queso, picadillo and guacamole. Chilli con queso, brisket and pico de gallo. Melted Jack cheese, homemade chorizo, rajas, salsa verde, flour tortillas. All served with jack cheese, pico de gallo, guacamole and sour cream. Black beans, brisket, cheese, avocado and fresh jalapeños. Spicy chicken breast, beans, cheese, guacamole and sour cream. 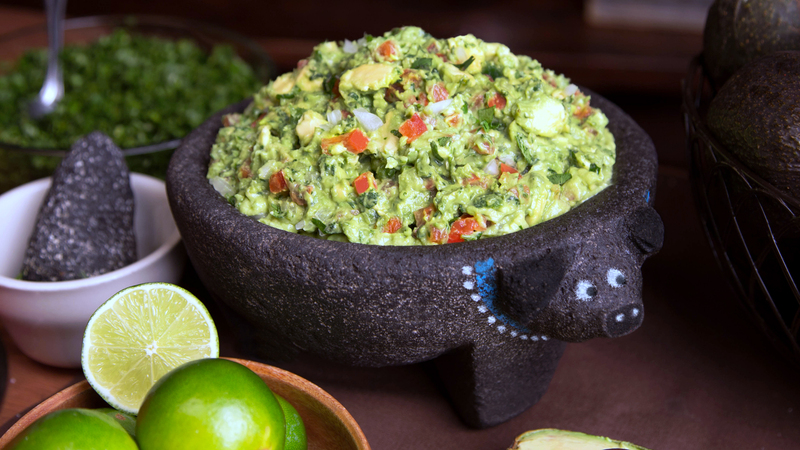 Chicken or beef, guacamole and pico de gallo. Beef and bean, guacamole and sour cream. Romaine, red cabbage, bacon, cheese, tomatoes, tortilla strips, avocado. Romaine, avocado, cucumber, tortilla strips, mango, pineapple, jicama and queso fresco. Served with mango pineapple vinaigrette. Romaine, black beans, jack cheese, rice, avocados, pico de gallo and grilled chicken. Romaine, red cabbage, cheddar and jack cheeses, tomatoes, tortilla strips and avocado in a tortilla shell. Light tomato broth, vegetables, chicken, avocado and rice. Brisket taco, shredded beef enchilada, pork tamale, pico de gallo and rice. Cheese enchilada, beef taco, pork tamale, rice and beans. Guacamole chalupa, beef taco, soft cheese taco and cheese enchilada. Taco al carbon, cup of soup (your choice), rice, guacamole and sour cream. Brisket taco, tomatillo chicken enchilada, Yucatan slaw, rice and black beans. 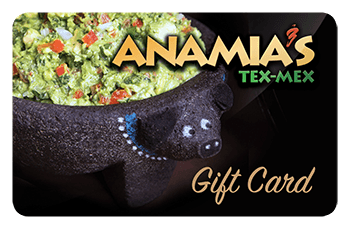 Grilled beef or chicken fajita served over rice, cheese enchilada, beans and pico de gallo. Large flour tortilla filled with your choice of filling, lightly fried and topped with Ranchero sauce, rice, beans, guacamole and sour cream. Chicken enchilada, cheese enchilada and soft cheese taco, rice and beans. Cheese enchilada, beef taco, rice and beans. Cheese enchilada, beef taco and chicken enchilada, rice and beans. Two beef burritos with choice of side sauce, rice and beans. Bean chalupa, tostada with queso and guacamole tostada. Chicken and spinach enchilada, puffed taco with guacamole and cheese enchilada. Two chicken enchiladas topped with roasted tomatillo sauce and queso fresco, créma, rice and beans. 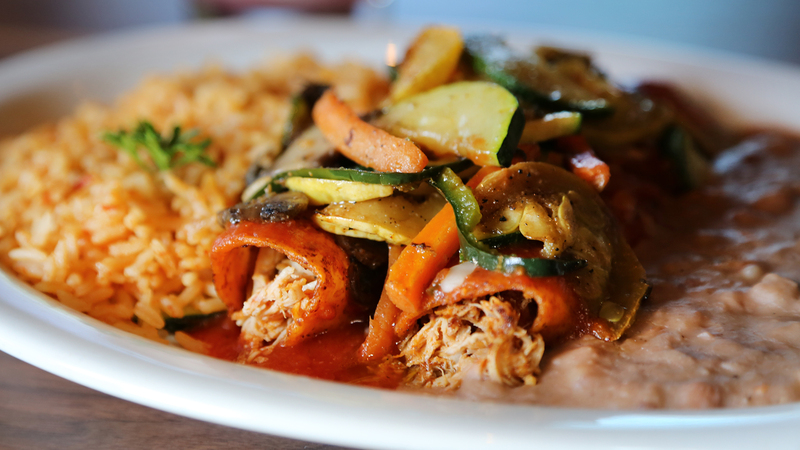 Two enchiladas (choice of cheese, chicken, beef or spinach) topped with a spicy queso picante sauce, rice and beans. Achiote citrus marinated chicken with pineapple, red onions & cilantro, served with arroz blanco & bean soup, Yucatan slaw, salsa verde. 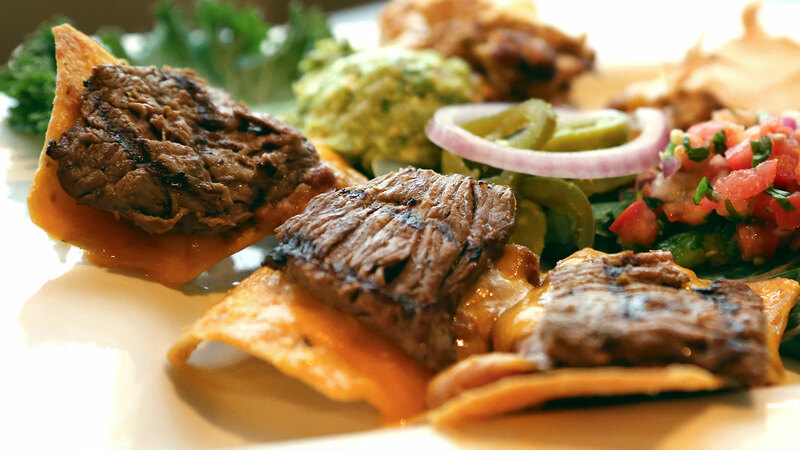 Three corn tortillas filled with grilled beef or chicken fajita and jack cheese, avocado salad, rice and bean soup. 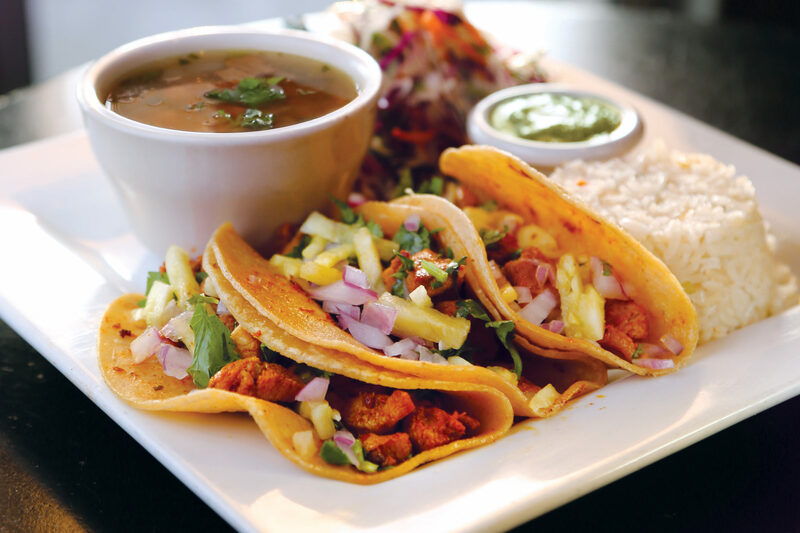 Marinated beef or chicken strips rolled in flour tortillas, served with bean soup, rice, guacamole and pico de gallo. Three corn tortillas filled with tender chicken breast sautéed in chili garlic sauce, avocado salad, bean soup and rice. Cajun rubbed, roasted jalapeño & tomatillo Aioli, shaved cabbage, jack & cheddar cheese served with black beans and rice. Grilled tilapia with garlic and lime, mixed vegetables, Yucatan slaw and rice. Shrimp sautéed in a spicy chile Guajillo,vegetables and rice. Shrimp sautéed in garlic and lime on a bed of vegetables and rice. Three flour tortillas filled with slow-roasted brisket, sautéed poblano peppers and onions, avocado salad, bean soup and rice. Served with onions, bell peppers, potatoes, guacamole, pico de gallo, cheese, rice and beans and flour tortillas. 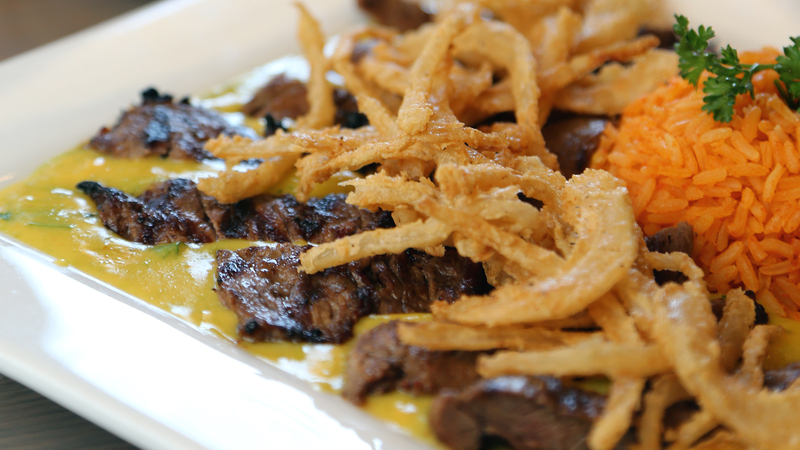 Spicy queso picante, crispy fried onion strips and guacamole.